Rumor has it that Jimmy Uso is out with a minor disclosed injury. This leaves Jey Uso to pick up the pieces. Jey can definitely handle things on his own. Remember when he faced Seth Rollins? Let’s see what will be in store for Jey while Jimmy is out. Since The Usos were drafted on Smackdown Live, The Universe has been wondering where will the tag team division fit into all of the new changes. Well for starters, The Usos came up short against Breezango at Battleground. Will this feud get the time of day or get pushed on the back burner. Will The Usos stay together or drift apart? With the WWE Draft coming up, The Usos, like many other Superstars are wondering where they will end up. They don’t care because they can get Uso Crazy anywhere. Jimmy and Jey Uso have sort of resurfaced on WWE TV this week. We haven’t seen much of them since the WWE Tour but they are slowly coming back. The Uso Crazy nation would love to see them in a feud. Personally the feud they had with The Dudley Boyz didn’t do much and I thought it could have been better. What is in store for the twins as they come upon the WWE Draft? What will they get into on Smackdown? * Seth Rollins defeated Jey Uso. Ambrose trolled Rollins on the mic and made some funny announcements during the match to great reactions. Rollins won a lengthy match with a Pedigree. Ambrose and Rollins had words after the match. Ambrose called Rollins a jackass and Ambrose rushed the ring but Rollins ran away. The Usos have been seen very rarely the last couple of weeks, but that all changes this week when they compete on WWE Superstars. While fans, look to see them on the main shows, we have to be grateful that they have a match this week. What is next for the brothers, only WWE knows the answer. As of late, Jimmy and Jey have been missing from WWE Events. But lo and behold The Brothers are back and they most likely have something to say. Who will they confront and why? *The Usos confront The Club backstage. After coming up a little short in their match against Luke Gallows and Karl Anderson, The Usos were able to help their cousin Roman Reigns return his title. With Roman’s target for his title changing from A.J. Styles to the returning Seth Rollins, where does this leave The Bloodline in all of this. Will they continue to stick together in this new feud or will the now broken up Club have something to say about it? What is in store for The Usos on Smackdown? The dark main event after tonight’s WWE SmackDown tapings in Norfolk, VA saw The Usos and WWE World Heavyweight Champion Roman Reigns defeat Sheamus, Luke Gallows and Karl Anderson in a standard six-man match. The Usos hit superkicks, then Reigns hit a Superman punch and a spear on Sheamus for the win. 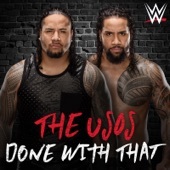 Over the past couple of weeks, The Usos have gotten the push (sort of) that their fans have been wanting for a long time. It came at the expense of A.J.’s friends Karl Anderson and Luke Gallows, but The Usos finally are in the spotlight. Unfortunately, it is crowded in the spotlight because their cousin Roman Reigns is with them. Anderson and Gallows have targeted The Usos and haven’t let them out of their sight. Raw after Raw, Smackdown after Smackdown both teams have been opponents in tag matches. Some won fairly and others overshadowed by Reigns vs Styles feud. Will this end up as family vs friends or will each break out in their own feud? Will The Family stick together or will the friends last forever? Who will get the upper hand on Smackdown? Ever since Roman Reigns has become WWE Champion, he has had a huge target on his back in the form of AJ Styles. AJ has been a tough competitor, but he couldn’t seem to get the title. Along comes his buddies Karl Anderson and Luke Gallows, who try to take him out, but the Usos have a lot to say about that. The Usos and Anderson and Gallows have been on each other’s radars for awhile. When Gallows and Anderson try to interfere, The Usos come to even it up. So now we have The Family vs The Club feud, with the title in the middle. Will The Usos continue to be by Roman’s side or will Anderson and Gallows turn on AJ first? After the disqualification win on Monday Night Raw, will Roman and The Usos remain on the top or will The Club rise to the occasion? * The Usos defeated Luke Gallows and Karl Anderson by DQ. The Usos started off strong until Gallows grabbed a handful of hair from the apron to turn it around. Anderson and Gallows kept control for a while, even surviving a hot tag. This led to dueling chants for The Usos. The heels controlled a bit more until an Uso superkick led to another hot tag. The crowd was really getting into the match as The Usos ran hot until Gallows hit one with a steel chair for the disqualification. Anderson and Gallows stand tall after a beatdown with chairs, leaving The Usos laying. This was the best match of the night so far, basically tag wrestling 101 but the crowd was hot by the end. The Usos know what it is like to stick up for someone, seeing how the twin brothers have been sticking up for each other since they were kids. When it comes to family, they know how to be there when it gets to be a lot to handle. That is what they did for their cousin Roman Reigns. That had his back at Payback, allowing him to retain his title. But the tables turned and they soon needed Roman to come to their aid on Raw. With Extreme Rules around the corner, how much more extreme can things get between these two teams.